Researchers at Columbia Engineering, who are experts at controlling matter at the nanoscale, have made a vital discovery in physics and materials science. Collaborating with colleagues from Princeton and Purdue Universities and Istituto Italiano di Tecnologia, the team has designed "artificial graphene" by recreating, for the first time, graphene’s electronic structure in a semiconductor device. Details of the research have been reported in Nature Nanotechnology. This milestone defines a new state-of-the-art in condensed matter science and nanofabrication, while artificial graphene has been demonstrated in other systems such as optical, molecular, and photonic lattices, these platforms lack the versatility and potential offered by semiconductor processing technologies. Semiconductor artificial graphene devices could be platforms to explore new types of electronic switches, transistors with superior properties, and even, perhaps, new ways of storing information based on exotic quantum mechanical states. Aron Pinczuk, professor of applied physics and physics, Columbia Engineering, senior author of the research. The discovery of graphene in the early 2000s produced incredible excitement among the physics community not only because it was the first real-world realization of a true 2D material but also because the exclusive atomic arrangement of the carbon atoms in graphene offered a platform for examining new quantum phenomena that are hard to observe in conventional materials systems. With its rare electronic properties, its electrons can move great distances before they are scattered. Graphene is an excellent conductor. These properties also display other unique features that make electrons act as if they are relativistic particles that travel close to the speed of light, conferring upon them unusual properties that "regular," non-relativistic electrons do not possess. But graphene, a natural substance, has just one atomic arrangement: the positions of the atoms in the graphene lattice are unchangeable, and therefore all experiments based on graphene must adjust to those restrictions. On the other hand, in artificial graphene the lattice can be designed over a broad range of spacings and configurations, making it a kind of Holy Grail for condensed matter researchers because it will have more adaptable properties than the natural material. This is a rapidly expanding area of research, and we are uncovering new phenomena that couldn't be accessed before, as we explore novel device concepts based on electrical control of artificial graphene, we can unlock the potential to expand frontiers in advanced optoelectronics and data processing. Shalom Wind, faculty member of the department of applied physics and applied mathematics and the study’s co-author. This work is really a major advance in artificial graphene. 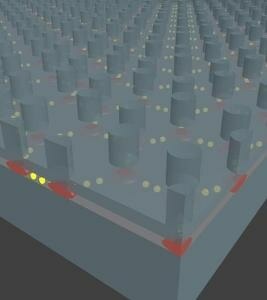 Since the first theoretical prediction that system with graphene-like electronic properties may be artificially created and tuned with patterned 2D electron gas, no one had succeeded, until the Columbia work, in directly observing these characteristics in engineered semiconductor nanostructures, previous work with molecules, atoms and photonic structures represent far less versatile and stable systems. The nanofabricated semiconductor structures open up tremendous opportunities for exploring exciting new science and practical applications. Steven G. Louie, professor of physics, University of California, Berkeley. The researchers used the tools of conventional chip technology to create the artificial graphene in a basic semiconductor material, gallium arsenide. They designed a layered structure so that the electrons could travel only within a very narrow layer, effectively forming a 2D sheet. They used etching and nanolithography to pattern the gallium arsenide: the patterning formed a hexagonal lattice of sites in which the electrons were restrained in the lateral direction. By placing these sites, which could be imagined as "artificial atoms," adequately close to one another (~ 50 nm apart), these artificial atoms could interact quantum mechanically, just like the way atoms share their electrons in solids. The research team investigated the electronic states of the artificial lattices by shining laser light on them and measuring the light that was dispersed. The scattered light revealed a loss of energy that matched to shifts in the electron energy from one state to another. When they mapped these changes, the team discovered that they were approaching zero in a linear manner around what is known as the "Dirac point" where the electron density disappears, a hallmark of graphene. This artificial graphene has numerous benefits over natural graphene: for example, researchers can design differences into the honeycomb lattice to control electronic behavior. Since the spacing between the quantum dots is a lot larger than the inter-atomic spacing in natural graphene, the researchers can see even more unusual quantum phenomena with the application of a magnetic field. The finding of new low-dimensional materials, such as graphene and other ultrathin, layered van der Waals films that display exciting new physical phenomena that were formerly inaccessible, laid the basis for this research. "What was really critical to our work was the impressive advancements in nanofabrication," Pinczuk notes. "These offer us an ever-increasing toolbox for creating a myriad of high-quality patterns at nanoscale dimensions. This is an exciting time to be a physicist working in our field."